It would seem logical at first to follow the line of thought that if something is good, more of that thing would be better. This is certainly the case if that something is chocolate. Because chocolate is good, but more chocolate is better. Finding $20 is good, but finding $50 is better. A free parking space is good, but no traffic at all is better. One cherry is good, but a handful of cherries are better. Ice Cream is good, but more ice cream? Better! See, this works on so many levels. There was a time, however, that if you had of told me asparagus is good but more asparagus is better, I would have told you that you were wrong on both accounts. In fact, I would have gone so far as to say that asparagus is bad and more asparagus is horrendous. At least that’s what my young and foolish self would have told you. When I was a youngster asparagus was right up there with mushrooms and olives on the list of things I did not eat. As far as I could tell, the only benefit to asparagus was that it was long and bright green and therefore easy to pick off my plate, (unlike mushrooms and olives which could be hidden in many dishes, only to shock my palate when I took an unsuspecting bite). Eventually though, I came around and realized that asparagus and mushrooms and olives are all wonderful and I now look for ways to incorporate them into my cooking. And what better way to incorporate asparagus than by pairing it with itself. If asparagus is good, asparagus dipped in asparagus is better. In my cookbook collection there lives a book with the best title I could imagine for a cookbook: Happy in the Kitchen. It’s by Michel Richard and it does an excellent job of proving that if something is good, more of that thing would be better with recipes like Potato Bites in Potato Baskets, Braised Carrots with Carrot-Top Sauce, Romaine on Romaine and yes, even Asparagus on Asparagus. The only change I made to this recipe was to roast some of the spears, cause that’s the way I like them and they look pretty on the plate next to the peeled and steamed spears. If you have not seen this book before, I urge you to check it out, it’s worth its weight in gold for the eye candy alone. Set aside 4 asparagus spears for the vinaigrette. Cut off the tough bottom ends of the asparagus spears and set those aside for the vinaigrette as well. With a vegetable peeler, peel the remaining asparagus spears from about an inch below the tip to the bottom of the spear. Set a steamer basket in a pot over simmering water. Place the peeled asparagus in the basket, cover, and steam for about 5 to 6 minutes, or until the spears are just tender with pierced with the tip of a paring knife. Be careful not to overcook the asparagus. Meanwhile, fill a bowl with ice water. When the asparagus is cooked, lift the spears with a pair of tongs and submerge them in the ice bath to cool, then remove and roll them in a clean kitchen towel to dry. For the vinaigrette, cut the reserved 4 asparagus spears into 1-inch pieces. Place in a small saucepan with the trimmed asparagus bottoms and add ¼ cup water and the olive oil. Bring to a simmer, cover, and simmer gently for 8 to 10 minutes, or until the asparagus is completely softened. The water should have evaporated, and the asparagus should be stewing in the oil. 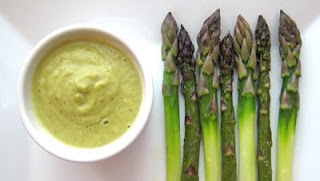 Pour the asparagus into a blender and puree until smooth. Transfer to a small bowl and whisk in the mustard, lemon juice, and a pinch each of sugar and salt. 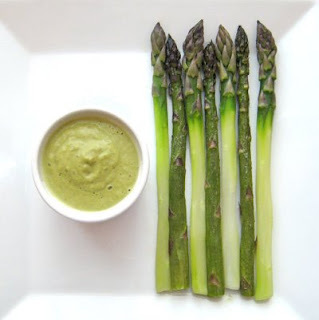 Serve the asparagus on a platter, with the vinaigrette in a small dish or ramekin on the side for dipping. Hint: For this presentation, the larger the spears, the better. This is an ‘interactive’ dish- the spears should be picked up and dipped in the vinaigrette. Posted by Brilynn at 11:58 p.m.
Is that a book review/recommendation? Because it sure seems like a great one to me! I like the way you think. That looks like a wondrful dish! Couldn't agree more about asparagus. In fact, yesterday I visited a local asparagus farm, where you can select your spears by size in the sorting room, fresh picked that morning. They are good enough to nibble on in the car on the way home! I actually had this at Richard's Central two weeks ago. It was incredibly good. Here in DC, Richard is an icon. The book is great. Richard is known for all these culinary Trompe-l'oeil, and he gives you some great example in the book. It's one of my favorites. 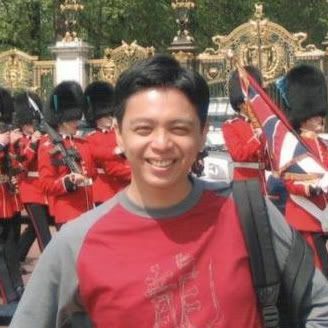 Isn't it funny how our tastes change as we get older? I'll look out for that book, great recipe for sure! I love asparagus! The more the merrier! I have some asparagus at home that needs eating. I think I will probably be making this tomorrow! I love Michel Richard-and he's in DC! That looks great! I always am looking for a good accompaniment to asparagus! I love asparagus. I had really wonderful asparagus when I lived in my native Brooklyn NY. But here in Clearwater Florida, the asparagus (even at Whole Foods where I spend most of my food stamps), the asparagus just isn't as good. And my boyfriend (if you can call a 56-year-old, 450-pound redneck a "boy") would NEVER eat asparagus. He calls it a yankee food, and would probably hit me again if I served it to him. Anyway, I think that I would never use anything other than Hollandaise sauce on my asparagus. I think I need to give asparagus a try again. It's been quite a while since I've had some, and this looks delicious! Asparaugus on asparagus sounds king of dirty. ;P But a good kind of dirty! I love asparagus, and this sounds delicious! I'll have to check out that book - it sounds like a fun one! u have a very neatly presented dish here. Ooh we love asparagus. I remember checking out Happy in the Kitchen from the library and telling myself I really need to get this cookbook. You may have nudged me even closer to doing so. i love that idea! mmmm i have a fresh bunch i can't wait to eat too. looks delish! thanks for posting, made me go back to the book, it has so many great, creative recipes... gotta put it to use! If you'd like to see more recipes from Happy in the Kitchen go here.